ARK. Noah’s Ark, which was used to take him, his wife, his sons and their wives, and animals of the earth, while the world that then was, flooded (Genesis, Chapters 6, 7 and 8, see UNPARDONABLE SIN). The Ark of the Covenant that Moses made held the Ten Commandments, Aaron’s rod that budded, and a pot of manna. (Later, according to I Kings 8:9, Aaron's rod and the pot of manna were taken out.) Also, the "law" (the first five books of the Bible) was placed “in the side” of the Ark, but it is not sure how this was done. “Take this book of the law, and put it in the side of the ark of the covenant of the LORD your God, that it may be there for a witness against thee” (Deuteronomy 31:26). This Ark was placed inside both the Tabernacle of the wilderness journeys, and later inside the Temple of Solomon (Numbers 10:30). Its whereabouts today are uncertain. I am not referring here to the Ten Commandments that were placed inside the Ark and are sometimes called the “tables” or “covenant” or “testimony”, but I am talking about the “book of the law" Deuteronomy 31:26 (the first five books of the Bible, Genesis-Deuteronomy). The Ark is important but not to be worshiped. The central location for the worship of Jehovah was Jerusalem, and the center for this was the magnificent Temple of Solomon. And the holiest room of the temple, in which the high priest only was allowed (and that only once a year), was for the golden Ark of the Covenant (Hebrew 9:7). There was only one Ark, as it is always spoken of in the Bible in the singular, never in the plural. It was at the “mercy seat” (the lid of the Ark) that God’s presence was seen in a small “cloud,” known as the “Shekinah glory cloud” (Leviticus 16:2) as He spoke to Moses (Exodus 25:22, Leviticus 16:2). On this mercy seat were two angels called “cherubim,” also made out of gold and facing one another, where God would meet with man. The Ark is considered the most sacred of all Jewish artifacts because it held the Ten Commandments written by the finger of God. Its purpose was to house the two tables of stone on which were written the Ten Commandments, hence the name “The Ark of the Covenant,” not the covenant of the Ark. What was inside the Ark was far more important that the Ark itself. The Ark was God’s throne here on Earth. “And David arose, and went with all the people that were with him from Baale of Judah, to bring up from thence the ark of God, whose name is called by the name of the LORD of hosts that dwelleth between the cherubims." (II Samuel 6:2, Isaiah 37:16). The mercy seat had a shallow, dished-out place where the high priest sprinkled the blood of a sacrificial animal for the sins of the nation. Directly under the mercy seat, inside the Ark, was placed the Ten Commandments, which shows our guilt before God. And as the high priest sprinkled the atonement blood on the mercy seat so Christ, God’s own Son, shed His blood for our sin debt. “Neither by the blood of goats and calves, but by his own blood he entered in once into the holy place, having obtained eternal redemption for us” (Hebrews 9:12). Jesus paid it all! And if He is your Savior then He has paid for all of your sins! Legends about finding the Ark of the Covenant. Through the centuries, thousands of people have searched for the Ark. There are countless modern tales about the final resting place of the Ark, and it is said to have been buried in every continent and almost every country, even in America and Japan. 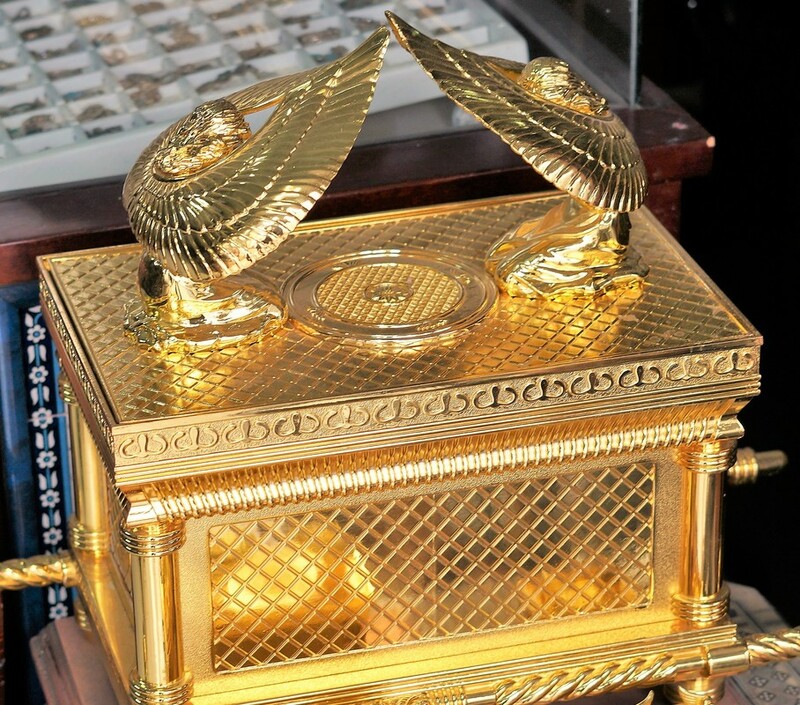 Different people have claimed to have found the Ark of the Covenant, but never any pictures! And one man said he gave the Ark of the Covenant to the Israeli government, but they deny this. This same man claims to have found a sample of the literal “blood of Christ”! And he said it only had “twenty-four chromosomes” (forty-six is the norm), but no one is allowed to do any independent research on this blood sample. Model of the Second Temple at Jerusalem in 66 AD. The Ark was in Solomon’s Temple (also referred to as the First Temple), but it is generally believed that it was removed prior to the destruction of Jerusalem in 586 BC by the Babylonians. After that the Bible is almost strangely quiet about what happened to the Ark. Josephus, a first-century Jewish historian, said the Ark was missing from the Second Temple (Bello Jud. v. 5. 5), or the temple of Jesus’s day, known as Herod’s Temple. The Babylonian Talmud echoes the same (Yoma 22b), and it is not depicted on the first-century Arch of Titus in Rome, which has other vessels of the temple. Interior of the “Arch of Titus” in Rome. Even the ancient enemies (Rome) of Israel acknowledge she was in the land of Israel and Jerusalem was her capital. We can safely say that the Ark did exist in the days of King Josiah (II Chronicles 35:3), because he lived about twenty-five years before the destruction of the First Temple. That would also eliminate the theories about the Queen of Sheba or Pharaoh Shishak taking it, for they lived hundreds of years before King Josiah. Revelation 11:19 talks about the Ark being in heaven. But when God told the children of Israel to build him a sanctuary, he said to make it “according to all that I shew thee, after the pattern of the tabernacle, and the pattern of all the instruments thereof, even so shall ye make it” (Exodus 25:9), and in the very next verse they are told to make the Ark. The book of Hebrews tells us the “true” tabernacle is in heaven (Hebrews 8:2 and 9:24); all that Moses made was after the “pattern” of the true one. So there already was an Ark and tabernacle in heaven before the earthly one. Jeremiah 3:16 says, “in those days ... neither shall they remember it [the Ark]; neither shall they visit it; neither shall that be done any more.” People have used this verse to teach that, in the future, there will not be an Ark. But “those days” refers to the time of the millennium (Which is after the Great Tribulation, see MILLENNIUM). It says they would not “remember it,” but we do today. The next verse says, “At that time they shall call Jerusalem the throne of the LORD; and all the nations shall be gathered unto it ....” Nor has this happened yet. Lamentations 2:9 says, “the law is no more...” and some believe this may refer to the Ten Commandments, saying that they and the Ark were destroyed. But another possibility is the Ark had already been taken and hidden by Jeremiah. There are several legends that have been passed down to us about the prophet Jeremiah taking the Ark with the permission of the good king Josiah, who reigned from 641–609 BC, and hiding it before the fall of Jerusalem. A simple search on the internet will bring to your computer screen a dozen or so ancient legends, translated in English, of where Jeremiah buried/hid the Ark. Most of these ancient accounts have Jeremiah hiding the Ark, or Jeremiah and angels, or other men who helped Jeremiah. These accounts almost always mention the Ark of the Covenant and often other items from the Tabernacle being hid along with the Ark. One of the most popular ones is found in II Maccabees 2:4–8 (first century, BC); it is not God’s Word but it is an interesting account. “It was also contained in the same writing, that the prophet, being warned of God, commanded the tabernacle and the ark to go with him, as he went forth into the mountain, where Moses climbed up, and saw the heritage of God. And when Jeremy [Jeremiah] came thither, he found a hollow cave, wherein he laid the tabernacle, and the ark, and the altar of incense, and so stopped the door. … As for that place, it shall be unknown until the time that God gather his people again together, and receive them unto mercy.” The mountain that Moses climbed up is generally believed to be Mount Nebo in Jordon. These and other ancient texts are interesting but contradictory. There are four basic locations these ancient legends will have Jeremiah burying the Ark: Jerusalem, Mount Nebo, Sela, and Mount Sinai. And the Babylonian Talmud (Yoma 52a) and II Esdras 10:21–22 both say the Ark was taken to Babylon. However, it can be deduced from II Thessalonians 2:3–4 that the Ark will be found. This passage said of the Antichrist (see ANTICHRIST) that “he as God sitteth in the temple of God.” Not only will he be in the future third Temple in Jerusalem, but it appears he is sitting on the Ark of the Covenant! And if it is not the Ark then what is the Antichrist sitting on? The Temple of God had no place to sit in it, there were no chairs or throne, except the Ark. It was not a place for the priests to take “coffee breaks.” If the Antichrist wants to receive worship, as the Bible says he does, then he would need to be in the room known as the “Holiest of all,” where the Ark was located (Hebrews 9:3–4). There were two cherubims, one on each end of the Ark, and a mercy seat in the middle, and this was where God met with man. And if the Antichrist wants to pretend to be God, then he would need to be in the place where God was. And the Bible says that this was where God was sitting, “he sitteth between the cherubims” (Psalm 99:1). But would there be enough room for a person’s body (the Antichrist, or an idol/image of the beast, Revelation 13:14–15) to sit there? “And the cherubims spread out their wings on high, covered with their wings over the mercy seat” (Exodus 37:8–9). It is not certain how this was arranged, and there are different depictions (models and paintings) of how their wings covered the Ark, with some having room for a person to sit there and some not. Is finding the Ark and other holy vessels a sign of the End Times? As in the account in II Maccabees, “as for that place, it shall be unknown until the time that God gather his people again together, and receive them unto mercy. Then shall the Lord shew them these things, and the glory of the Lord shall appear.” Also The Biblical Antiquities of Philo said, “shall be there until I remember the world, and visit the dwellers upon earth.” These, and almost all ancient accounts of the prophet Jeremiah burying the Ark have the discovery of it happening at the end of this present age. But again, these are legends, not from God’s Word from the Bible, and they are contradictory. However, because of what was said in II Thessalonians 2:3–4, I believe it will be found and used during the Tribulation. How much sooner than the seven-year tribulation can only be guessed at. Still it is a wonder that God has kept it hidden until now! Most all depictions of how the Ark was carried are wrong! Normally a picture or engraving of the Ark shows four men carrying a golden chest with two golden angels (cherubims) overshadowing the Ark. Though I do not fault them on their design of the Ark of the Covenant, I believe it was not transported this way, and I have an important reason why this needs to be explained. Numbers 4:12–15 says, “And they shall take all the instruments of ministry, wherewith they minister in the sanctuary, and put them in a cloth of blue, and cover them with a covering of badgers' skins, and shall put them on a bar: And when Aaron and his sons have made an end of covering the sanctuary, and all the vessels of the sanctuary, as the camp is to set forward; after that, the sons of Kohath shall come to bear it: but they shall not touch any holy thing, lest they die.” The sons of Kohath carried the Ark by the two poles but did not touch the Ark; it was covered, as were all the holy vessels. But not only could someone not touch the holy vessels from the Tabernacle, he could “not come nigh” the holy vessels. “Neither must the children of Israel henceforth come nigh the tabernacle of the congregation, lest they bear sin, and die” (Numbers 18:22). “And when the tabernacle setteth forward, the Levites shall take it down: and when the tabernacle is to be pitched, the Levites shall set it up: and the stranger that cometh nigh shall be put to death” (Numbers 1:51, 3:10, 38, 18:7). “And they shall keep thy charge, and the charge of all the tabernacle: only they shall not come nigh the vessels of the sanctuary and the altar, that neither they, nor ye also, die” (Numbers 18:3). Even the high priest was warned about this: “Tell your brother Aaron not to come whenever he chooses into the Most Holy Place behind the curtain in front of the atonement cover on the ark, or else he will die ...” (Leviticus 16:2). But more than this, other than the priest in the tabernacle who covered the Ark, no one was allowed to see the Ark, not even those who carried it! “Cut ye not off the tribe of the families of the Kohathites from among the Levites: But thus do unto them, that they may live, and not die, when they approach unto the most holy things: Aaron and his sons shall go in, and appoint them every one to his service and to his burden: But they shall not go in to see when the holy things are covered, lest they die” (Numbers 4:18–19). I know of no other so oft repeated warnings in the Bible as those associated with the Tabernacle vessels, especially the Ark, and those were punishable by death! That is why we read of the children of Israel saying, “Behold, we die, we perish, we all perish. Whosoever cometh any thing near unto the tabernacle of the LORD shall die: shall we be consumed with dying?” (Numbers 17:12–13). Why so many warnings? God did not want them to become too familiar with the “holy ark” (II Chronicles 35:3), which represented the presence of God. God is not our “good buddy,” but He is to be revered and also feared: “Have grace, whereby we may serve God acceptably with reverence and godly fear” (Hebrews 12:28). So when the Bible says we are to “fear” God it does not mean reverences, but the Bible verse just quoted plainly said we are to serve God with both, “with reverence and godly fear.” These and many other verses make it clear the Ark of the Covenant was not a toy, or an electric battery, or cell phone to text God; not a star gate, not an oracle box, nor to be put in a museum and sell tickets for people to gawk at. Question: How could anyone find the Ark and then bring it to Israel? Would he not die just looking upon it? It is certainly true that a Christian’s body is the temple of God: “Your body is the temple of the Holy Ghost which is in you” (I Corinthians 6:19). And we can go directly to God without a Temple, Tabernacle, or any vessels and earthly priest! “Having therefore, brethren, boldness to enter into the holiest by the blood of Jesus, By a new and living way, which he hath consecrated for us, through the veil, that is to say, his flesh” (Hebrews 10:19–20, 4:16). Today, Christians have no need for the Ark of the Covenant because we are in the church age, and God has provided a better sacrifice than any animal sacrifice. And because of this, some believe there are no longer any restrictions against a Christian looking at, being near, or touching the Ark. “And they that are far off shall come and build in the temple of the LORD, and ye shall know that the LORD of hosts hath sent me unto you” (Zechariah 6:15). Shlomo Goren, a Talmudic scholar and foremost authority on Jewish law, concluded from this passage in Zechariah that the “far off” ones are gentiles and that not only would gentiles help in restoring the Temple worship but also in finding the Temple vessels. Still, a gentile could not touch the Robe of the Ephod or cut a piece off to carbon date it. At the least, to an Israelite, for a gentile to touch any of the vessels or priestly garments would be thought of as defiling them. There are many sincere people and treasure hunters who have looked and will continue to look for the Ark. And I believe, based on II Thessalonians 2:3–4, that the Ark will eventually be found, whether by a gentile or an Israelite. If the vessels of the Tabernacle were hidden by the prophet Jeremiah, he would have left their coverings on them. And if someone should stumble across them, unless he is expressly ordained for this, as given in the Bible, I suggest he does not “snoop” around; but rather point them out to the Jews because of the warnings of death to anyone who would touch or look at these vessels. And what will happen when the Ark is found? When King David brought the Ark into Jerusalem (II Samuel 6:15–16), he set up a tent for the Ark before his son King Solomon built a Temple. “So they brought the ark of God, and set it in the midst of the tent that David had pitched for it: and they offered burnt sacrifices and peace offerings before God” (I Chronicles 16:1). I know of no reason this could not be done today until such time when the future Temple would be built. ​​ Please read the other doctrines and pray for this website to be used of God and to help Christians!